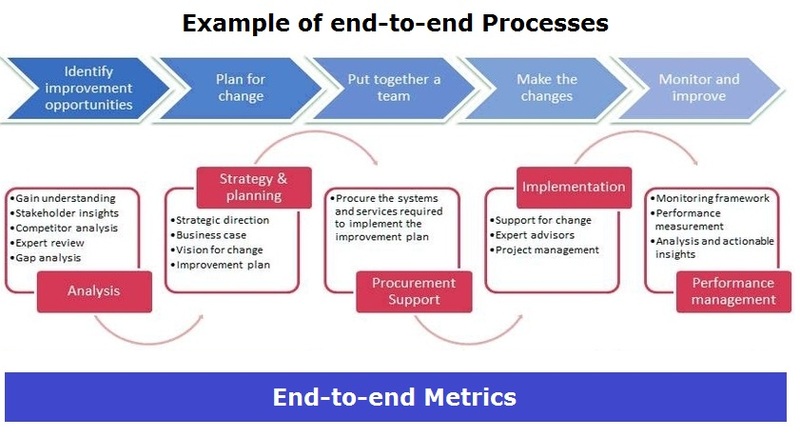 End-To-End Process – End-To-End Process Analysis – End-To-End Process Framework – The end to end process refers to all activities and sub processes required to complete a certain task or a job start to finish. Usually end-to-end processes involve a number of siloed groups with the product or service being transferred from one group to another. The reason why we want to view processes on end-to-end basis is because we need to recognize that from the point of view of the customer or the overall company, the process needs to be managed / enhanced start to finish. In the past, siloed groups only managed their part of the process, which resulted in duplication of effort, redundancies and limited strategic view. The processes need to be supported with end-to-end metrics such as the total cycle time required to complete a job.